The coolest teen fashion magazine is looking for fashion-savvy girls to be on their advisory panel. 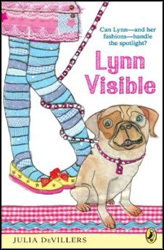 It's perfect for Lynn Vincent, who eats, breathes, and sleeps fashion. However Lynn is so fashion forward that she's years ahead of the trends in her small town. Lynn is so in, she's out, especially with Chasey Welch and her popular circle. But Lynn may finally get her moment in the spotlight-and on the runway - when a famous designer gets her hands on one of Lynn's unique creations. High school freshman Lynn Vincent's bold fashion sense always makes a big impression. While Lynn knows "it would have been much easier for me to put on the typical high-schooler outfit," she can't help but be herself, creating combinations so outrageous that her best friend Taylor's mother wishes Taylor would find more traditional friends (on the first day of school Lynn wears a plaid shirt, pink tutu skirt, kneesocks, and fedora). Then popular magazine GlITter Girl sponsors a contest to find teens on the cutting edge of fashion. The day of the audition, Lynn trips and sends a homemade shoe flying onto the salad plate of one of the judges, a famous designer. Like Prince Charming pursuing Cinderella with a glass slipper, the magazine finds Lynn with the aid of her shoe and asks her to be its very first IT Girl, launching her into the limelight. DeVillers (Liberty Porter, First Daughter) keeps Lynn true to herself: her funky, conversational tone never wavers, even when the powers-that-be want to change her designs. The story celebrates individualism and friendship and should generate smiles. Ages 10-up.